This is the start of my annual skiing trip during Christmas and I was actually nearly late for the flight due to a traffic jam that the airport staff called my Dad as I had added his number for my emergency contact. They did try to call me but for some reason I did not receive the call due to spotty cell signal. On reaching the airport, I was the last passenger to be checked in. During check-in the agent asked about my travel insurance and asked to see my return tickets since they were bought separately but after that I got my boarding pass fast though I noticed a change in my seat assignment. 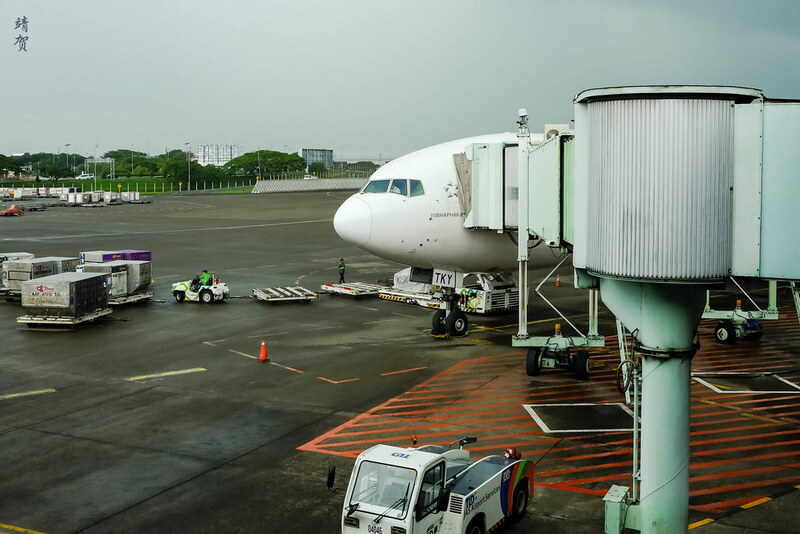 As it turns out the flight was operated by a 777 instead of a 787. 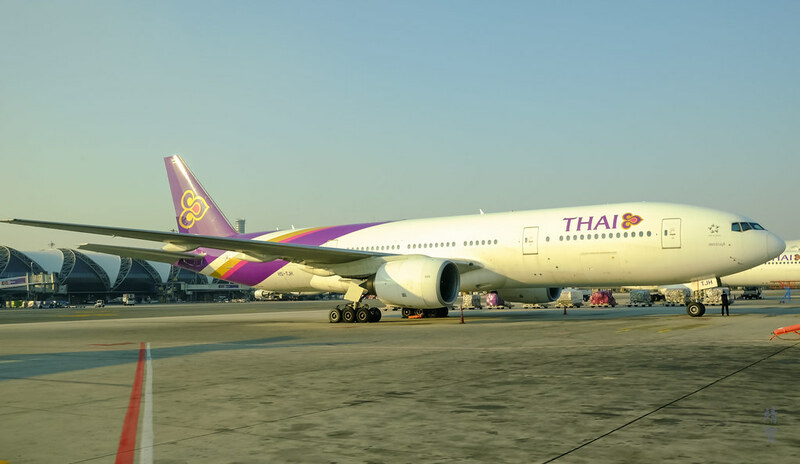 And it was Thai’s newer 777-300ER too! While the seat was an upgrade, I had wanted to try the seats on the 787 so it was not really what I wanted. 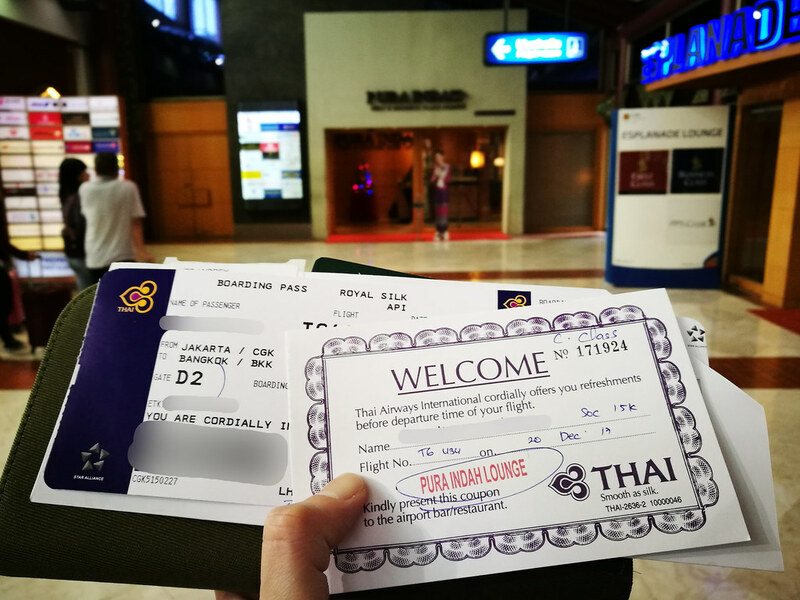 Thai Airways does not use the Premium check-in counters thus Business class passengers do not get fast track. However as I had an e-Passport, I was able to use the automated gates which means no queues today. 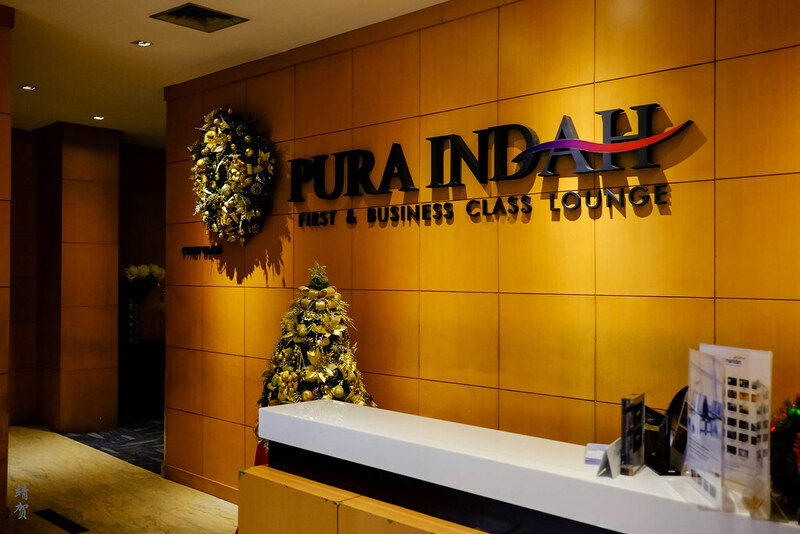 With that it left me some time to visit the Pura Indah lounge which was packed during lunch hour. I would not review the lounge as it was too crowded and I did not have any food. It is just a basic lounge in my view but it does have some useful magazines and newspapers that I grabbed to read on the plane. After spending some time in the lounge, I head to the gates for the security clearance, which had short queues. As such, I arrived at the gate as boarding started. The gates at Terminal 2 does not provide a nice view for taking photos of my ride today so the nose is all I got but I still managed to spot the plane name and registration. 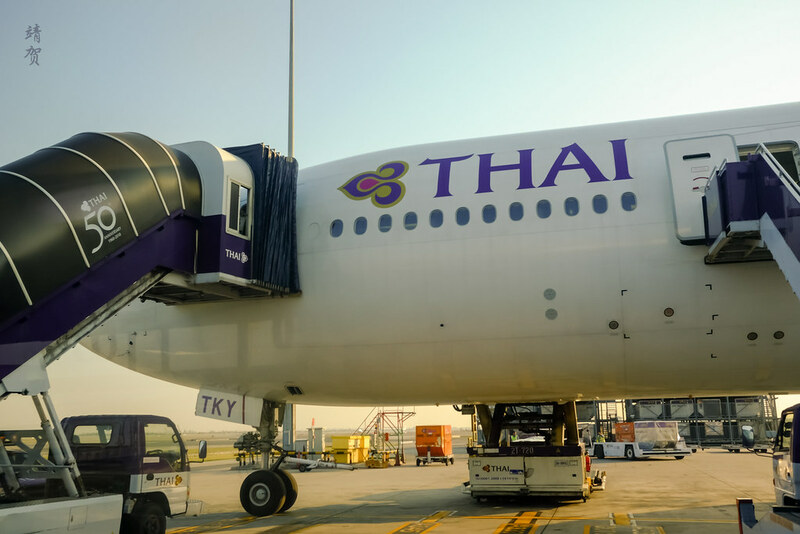 Entering the plane, the cabin is fitted in a staggered 1-2-1 configuration similar to Thai’s Airbus A350. 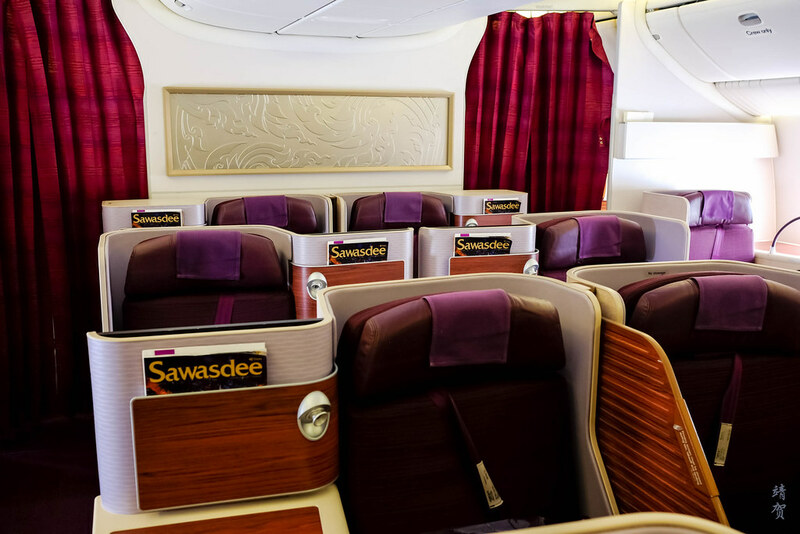 Thai Airways decided to not install a ‘First Class’ cabin even on the larger 777-300ER and this meant guests looking to fly with Thai First are limited to routes operated by the A380s and 747s. 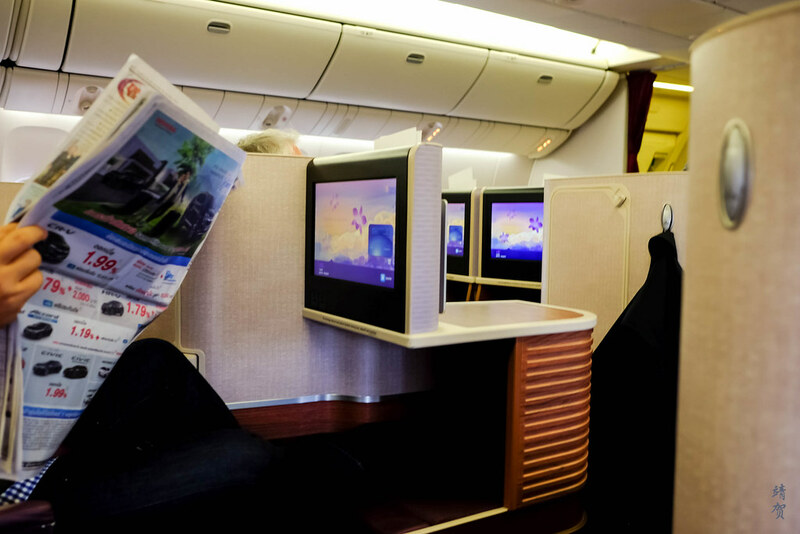 As I settled down into my seat on the first section of the Royal Silk cabin, warm towels were distributed to guests. 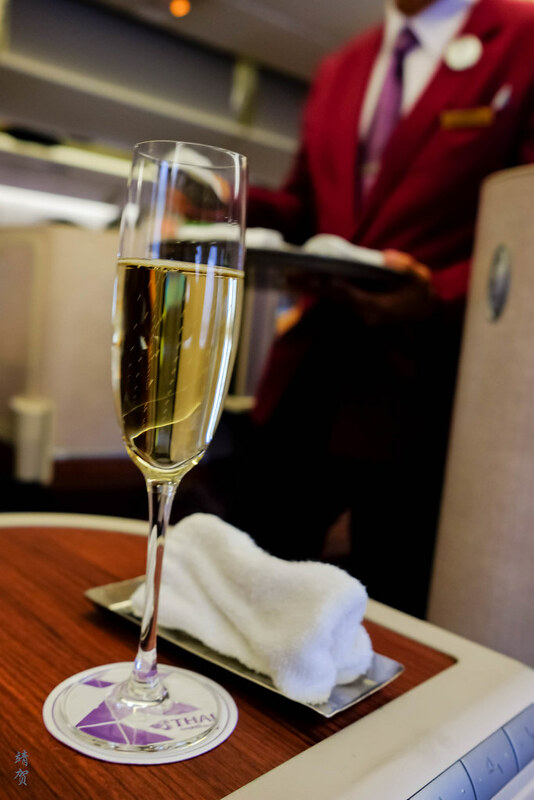 Champagne or orange juice was offered to passengers. Newspapers were offered but it was mainly Indonesian and Thai newspapers. However I had already taken a copy of the ‘New York Times’ from the lounge. 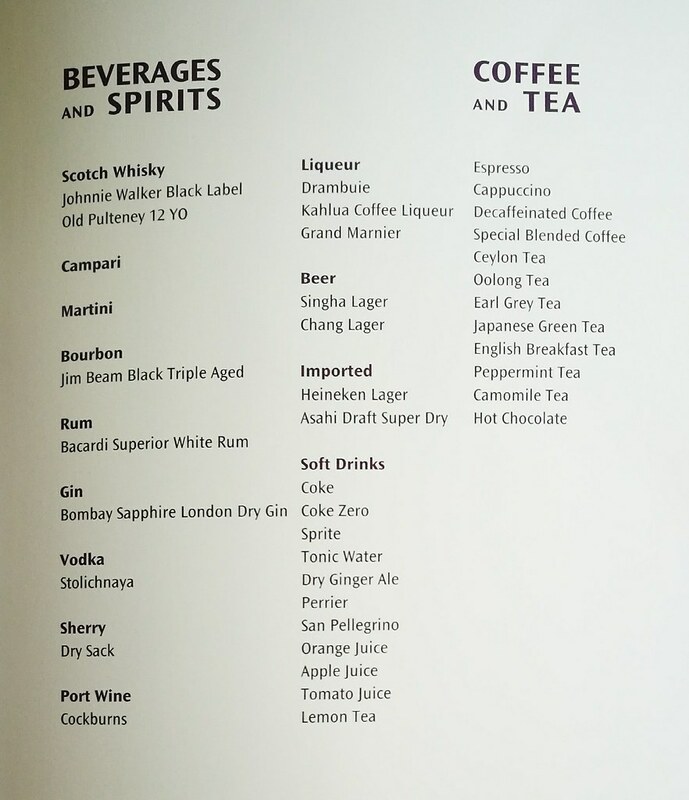 Three set menus were available along with an extensive drinks option which was more than adequate for a 3 hour regional flight. 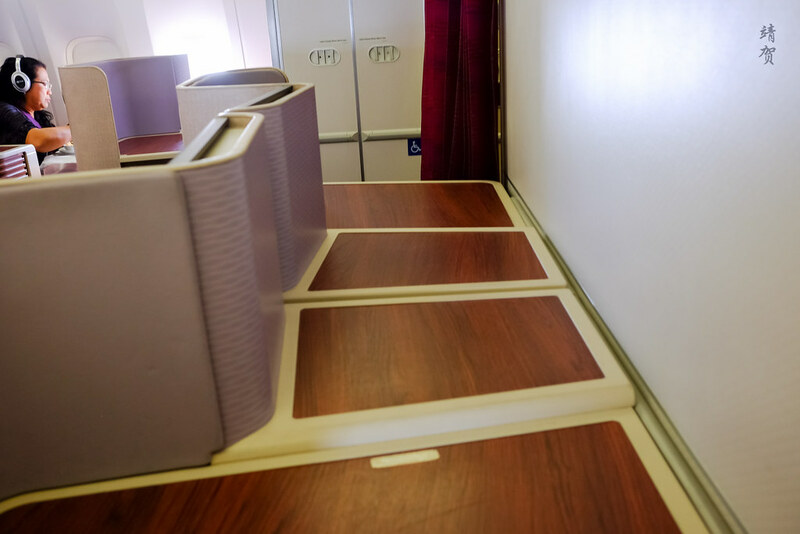 After the meal orders were taken, I spent some time taking photos of the cabin and just checking out the seat amenities. With the heavy rain outside, there was obviously no rush to take off. Once boarding was completed, the captain announced the flight times and welcomed passengers onboard. 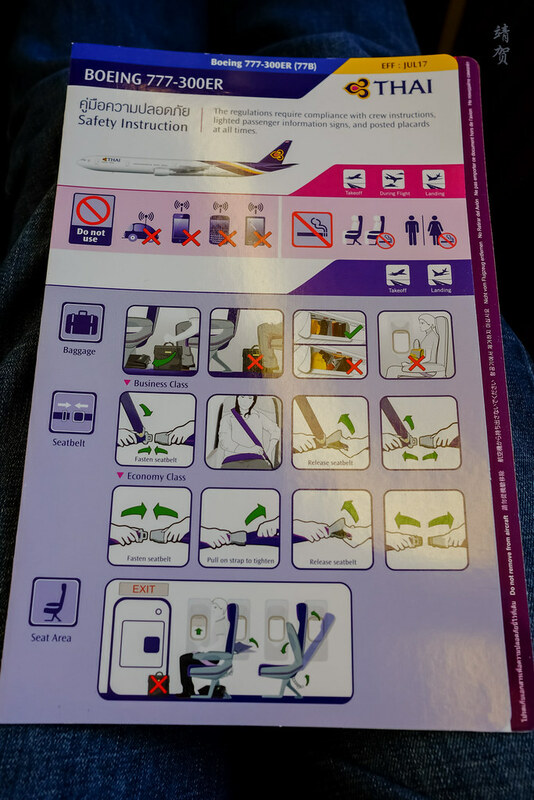 I noticed the flight was quite full in the front business class cabin but nearly empty in the second cabin. Perhaps Economy class was full that they had to switch to a larger plane? Luckily for us the heavy tropical rainstorm during boarding subsided once we started pullback. 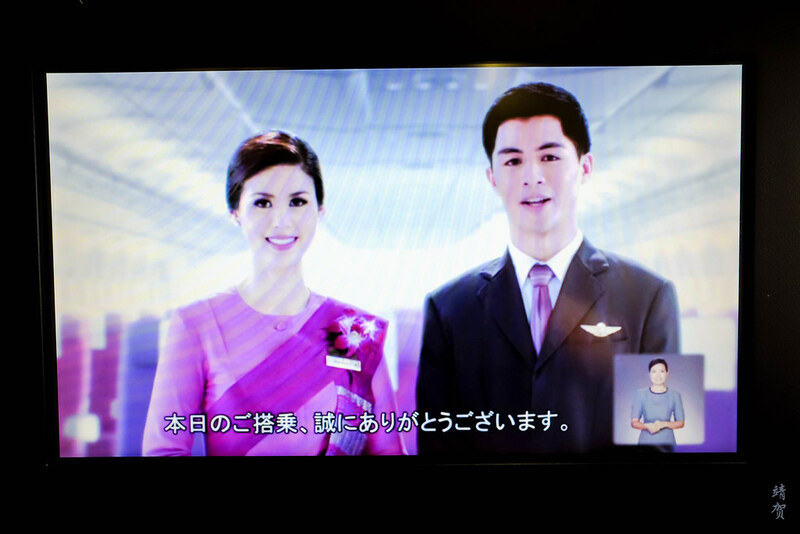 The safety videos were played after the standard welcome. 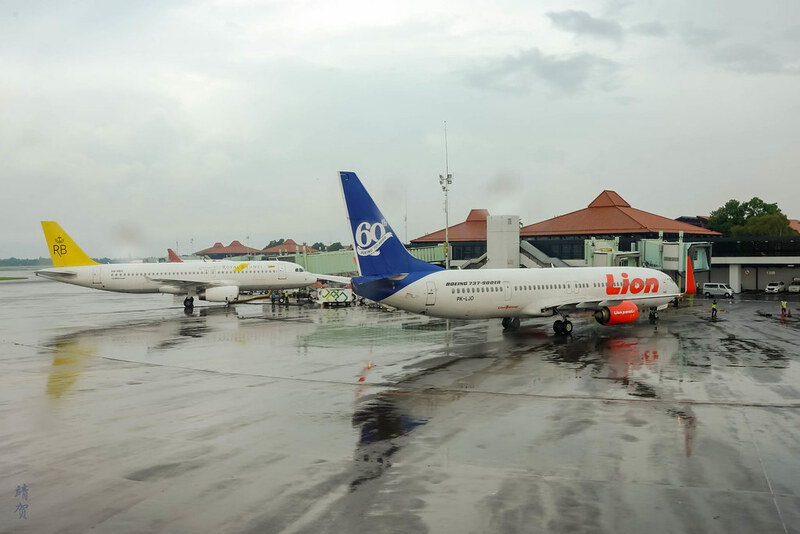 However as usual in Jakarta, the long queue for the runway caused a delay in our departure. It was nearly half an hour before we took off after our pullback. 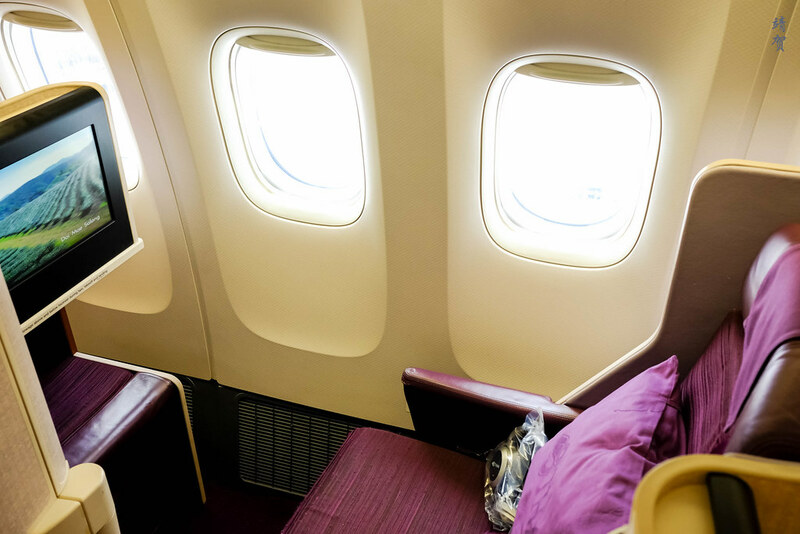 With the staggered Business class setup and me having the window seat, it was a private space and as my photos show, it is not easy to spot the other passengers’ face from your seat. Once we reach the cruising altitude, the seat belts sign were switched off and I started browsing through the entertainment selection. Passengers could actually start watching once they are onboard already but I was reading my newspaper and magazines then. With the seat controls, I settled on a comfortable position and used the headset provided onboard to watch the movie ‘Baby Driver’. 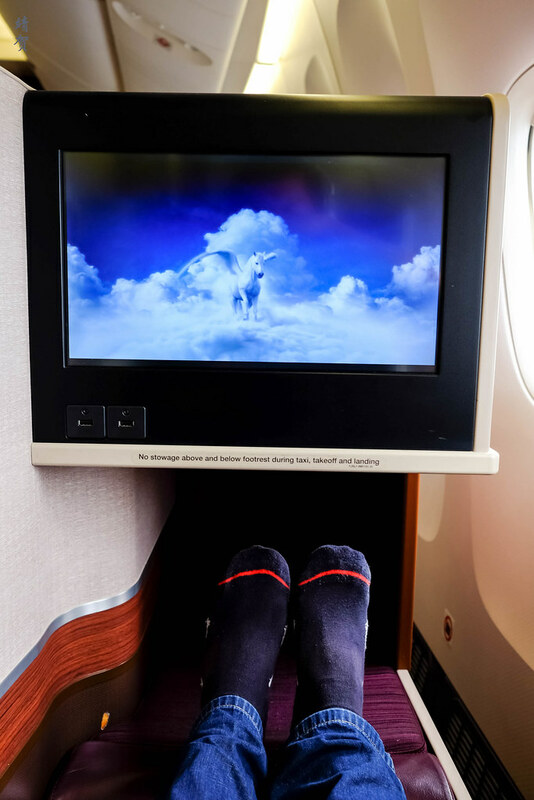 These staggered seats have cubby holes for the feet that are spacious enough and have a foot rest with under-side storage for smaller bags. 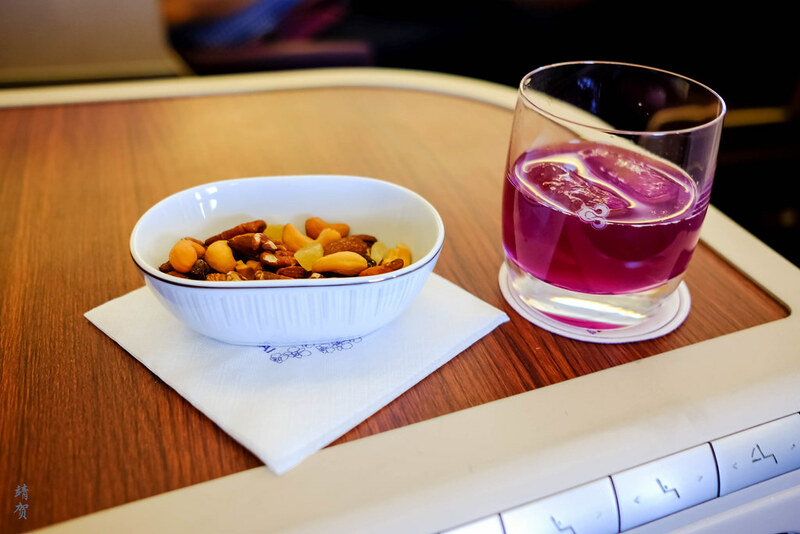 Inflight service got underway with a bowl of mixed nuts and dried fruits that was served with my choice of beverage. 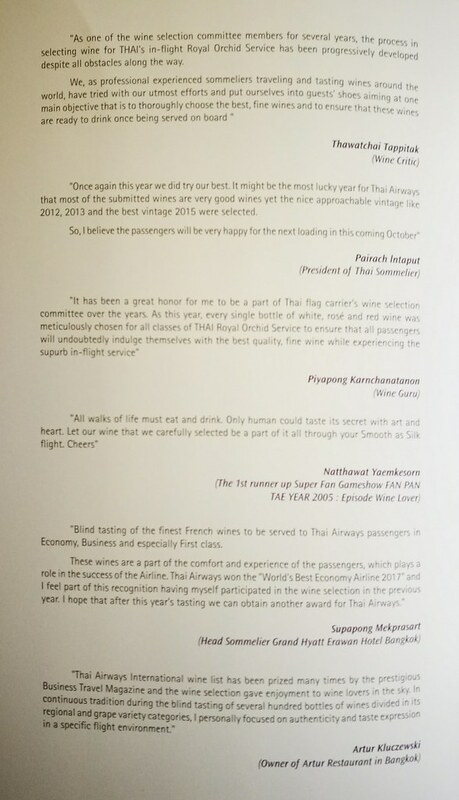 And onboard Thai, I usually have the butterfly pea drink which is a sweet non-alcoholic drink unique to the airline. As I was taking photos, I dropped my lens cover on the side of the seat during this time. I requested for assistance from the crew but they were unable to retrieve it after several tries. This meant I needed to wait for the maintenance crew to help me at the end of the flight. 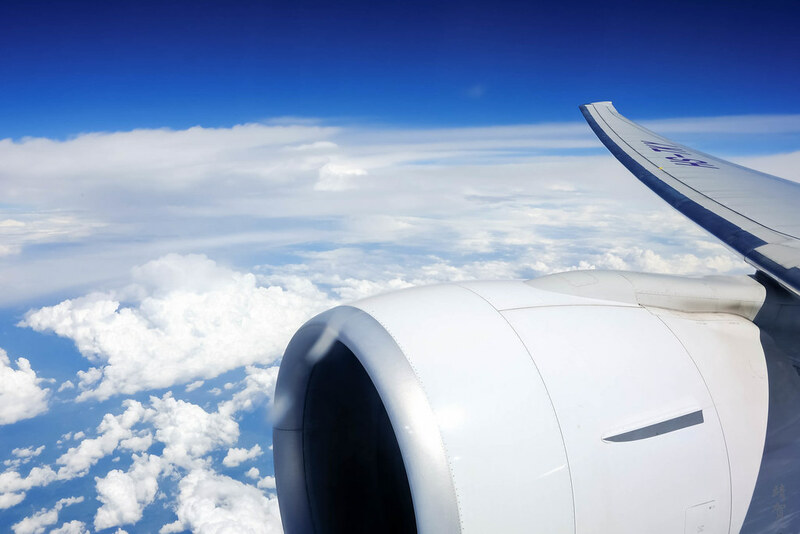 The crew did mention it is common for items to drop onto the side and due to the gap on the sides of the seat, they fall below the seat mechanism making it tricky to retrieve it. 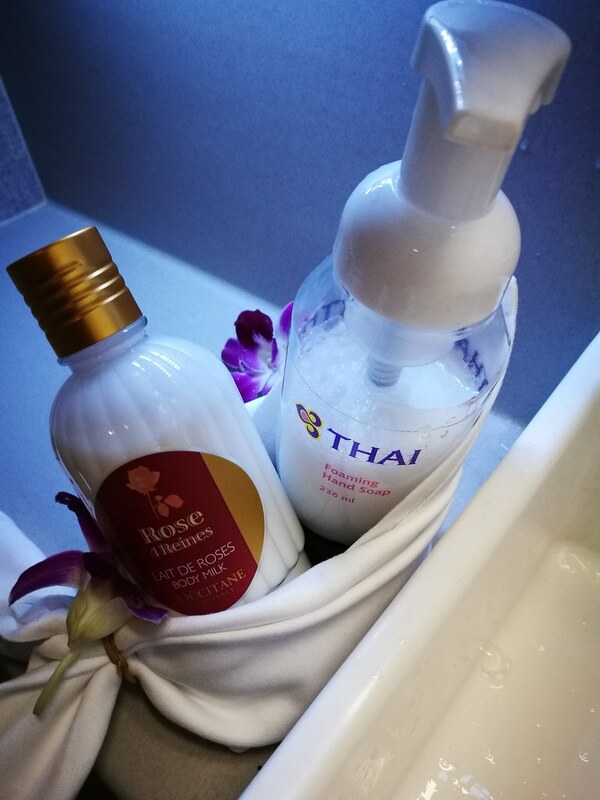 Prior to the meal service, I visited the lavatory to wash my hand and noticed it was equipped with a body mist and L’Occitane body lotion. A foaming hand soap was also provided. 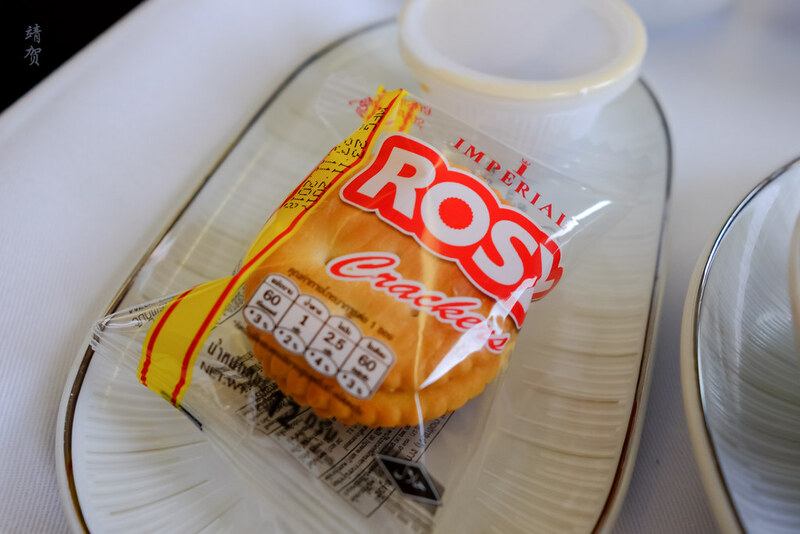 Amenities wise, it was respectable in Business class and the lavatories are well maintained. 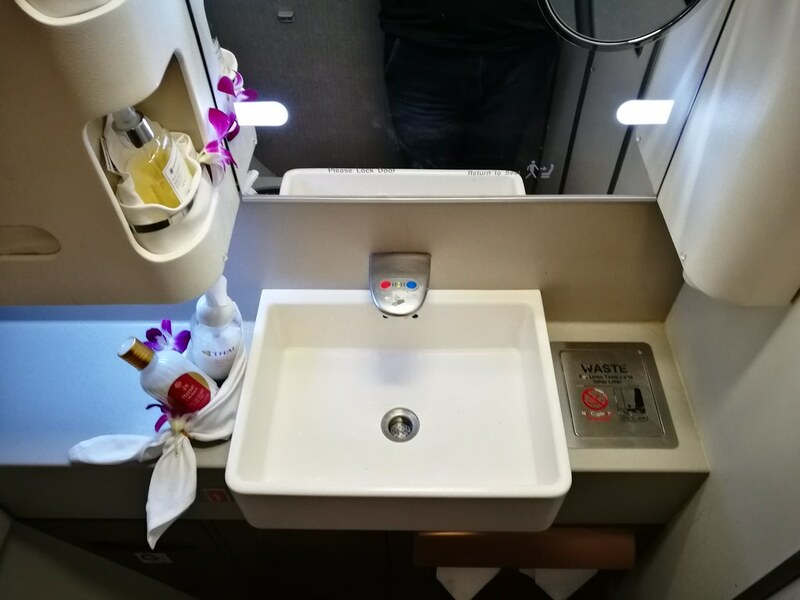 There are a total of 4 lavatories in the cabin with 2 in the front and 2 in the middle galley separating the Business class cabin. The meal service started shortly upon returning to my seat. 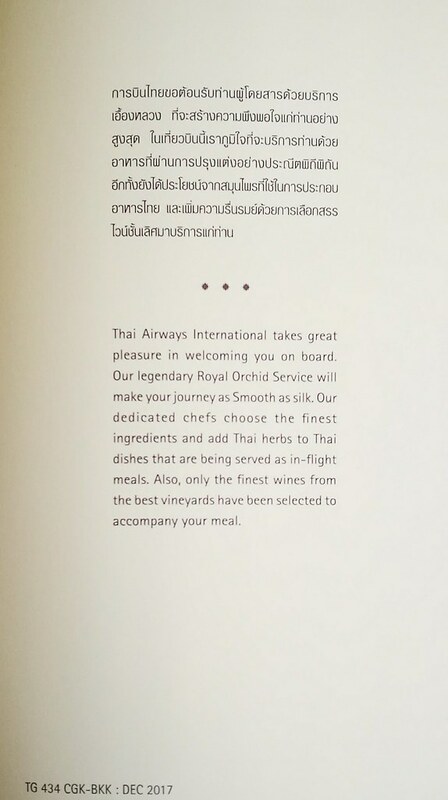 With the Thai meal, everything except the dessert was placed in one tray. It was recommended by the crew and the chicken dish was spicy. 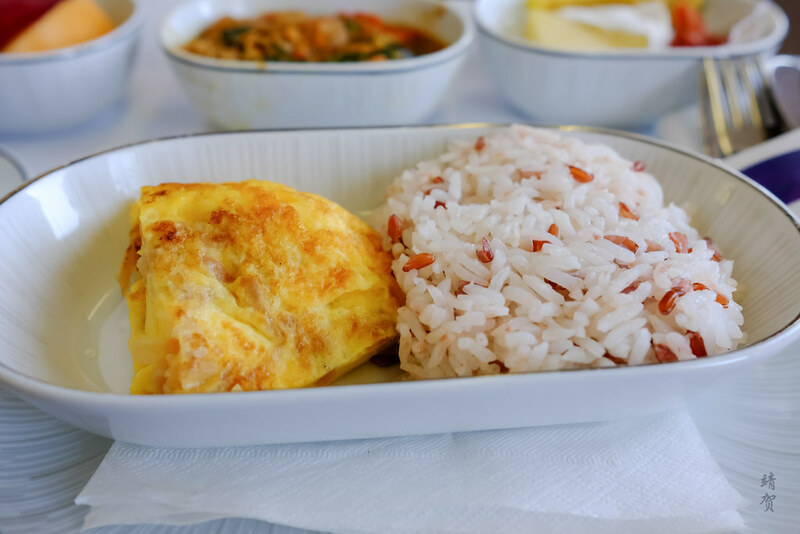 My favourite was the omelette which is similar to what one can find in the streets of Thailand. A fruit bowl was on the tray along with a cheese plate and a pack of crackers. 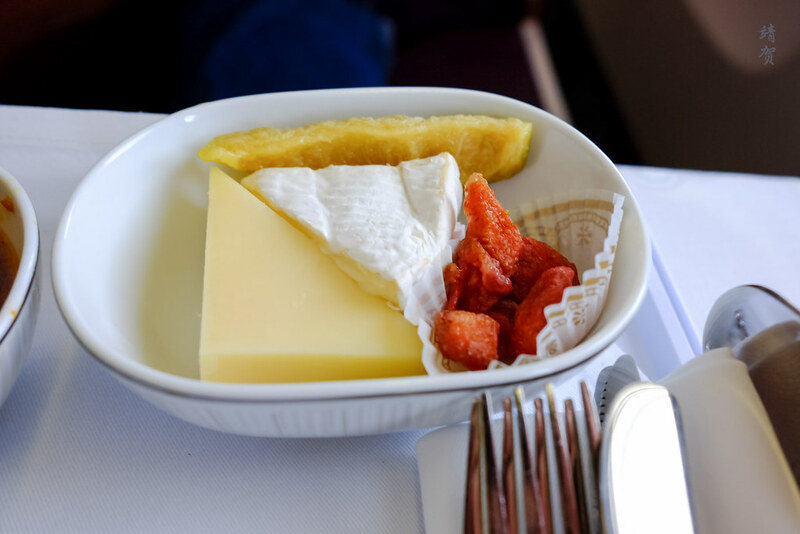 Dried strawberries was added to the cheese plate and the strawberries is a classic snack in the Thai Airways lounge in Bangkok. 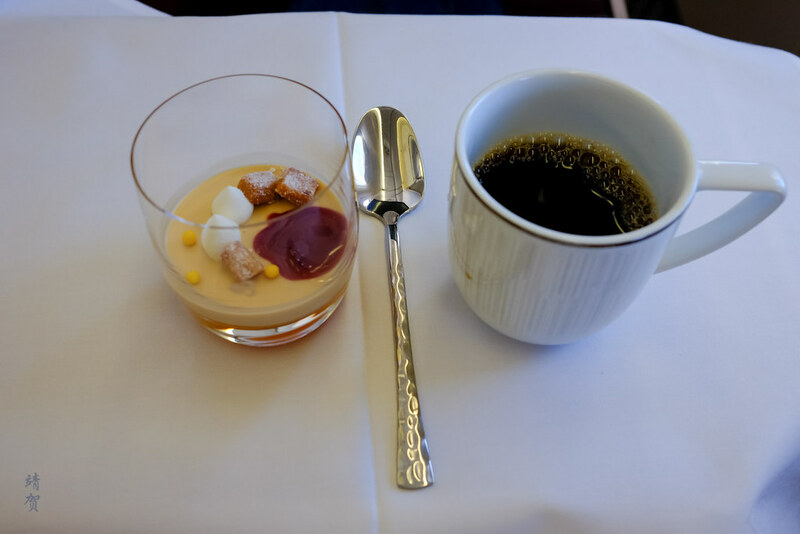 Dessert was served separately and offered to passengers with coffee or tea. 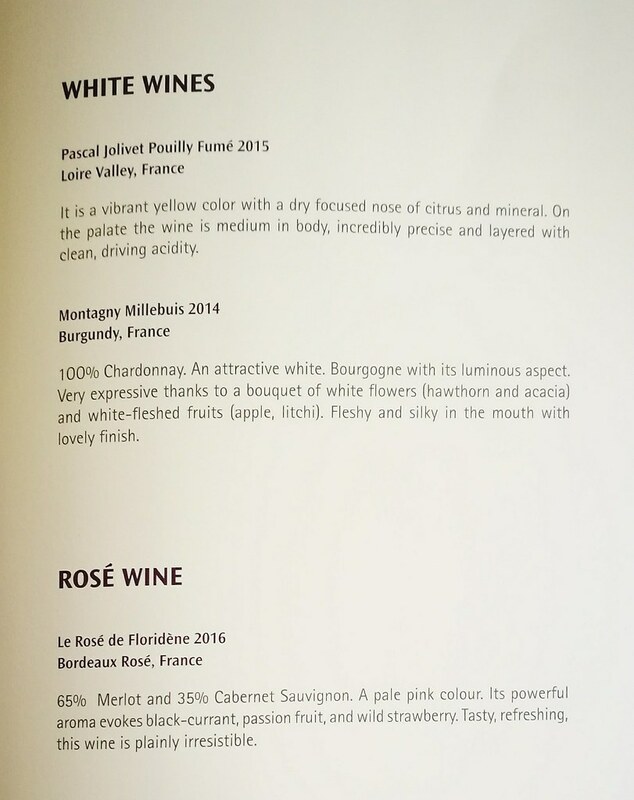 For this flight it was a panna cotta that was enjoyable but a bit too rich for my taste. 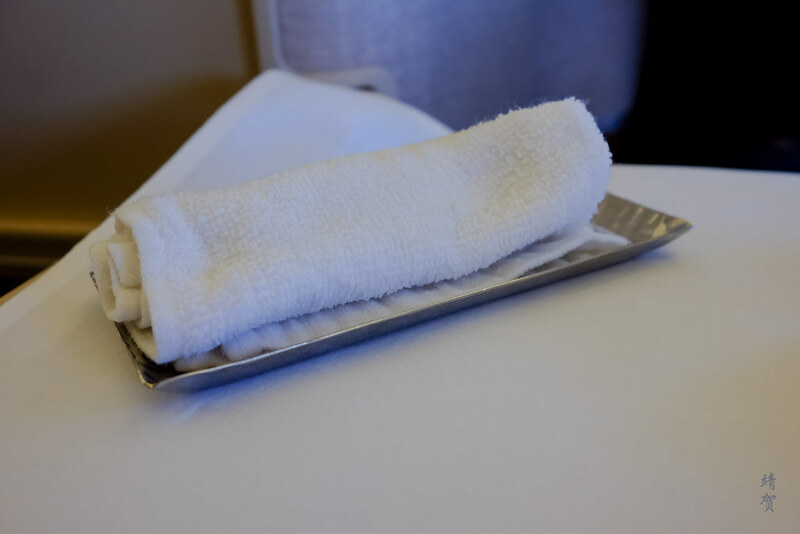 A cold towel was placed on the side armrest for guests after the meal service. 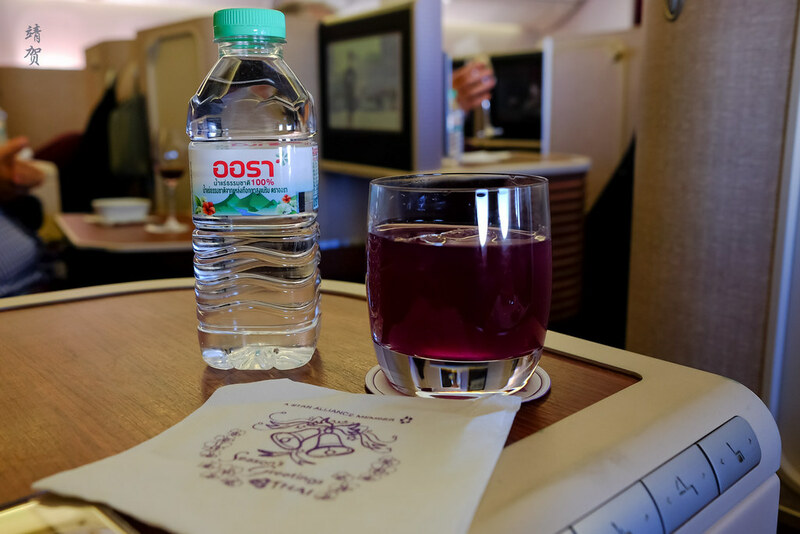 A bottle of water was also distributed around the cabin and I was able to request for another cup of the butterfly pea drink. Cabin light was dimmed after the meal service and some passengers took the time to sleep. Meanwhile, I continued watching Baby Driver and found the headphones to be average as they are generic headphones supplied to many Business class cabins. I should have brought along my personal headphones in retrospect. With an afternoon flight and this being the first flight, I wanted to reserve sleep for the long haul journey tonight. 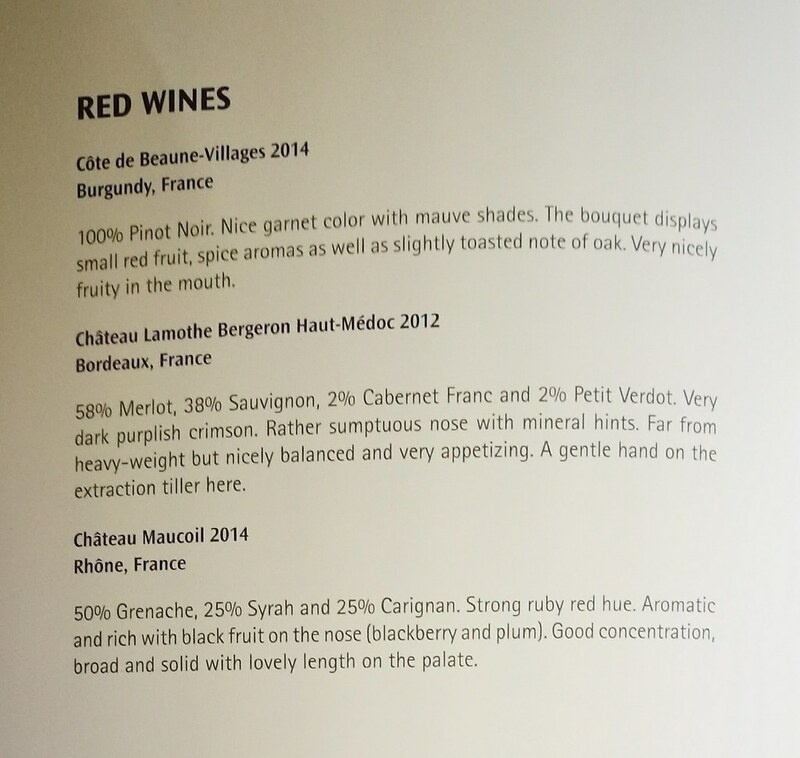 Thus I walked around the second Business class cabin for a seat. I did this to allow the cabin supervisor to try to retrieve my lens cap from below my seat as well. Bulkhead seats here does not have any difference to the standard seats as there is still a covered footwell with the top of this footwell acting as extra storage space for pillows and blankets. 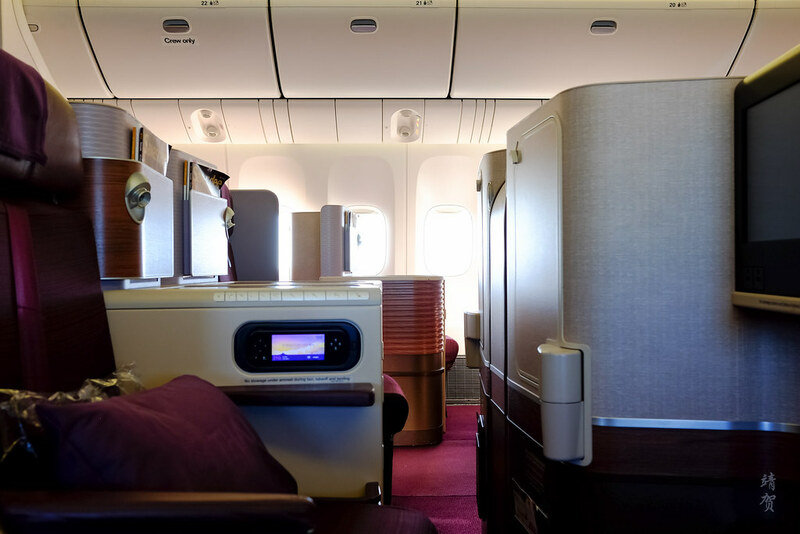 Both the cabin on the new 777-300ER and A350 have similar colour scheme and the seats seems to be similar. 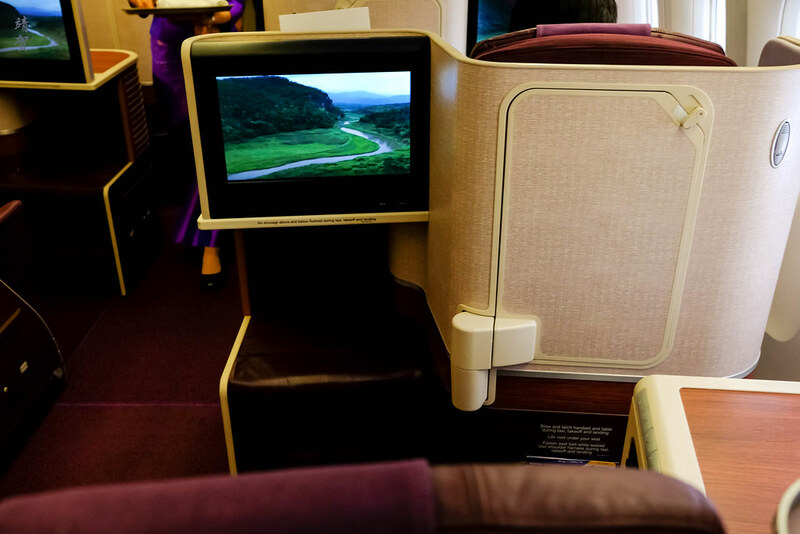 Although I believe the seat on the 777 is somewhat more spacious, the difference is not that obvious. Thus I would not pick to fly the 777 over the A350. 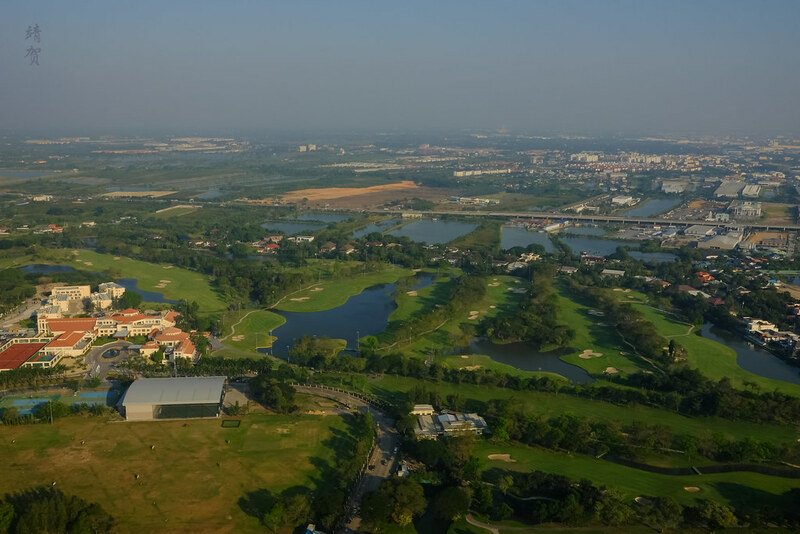 On our descent to Bangkok, there was a nice sunset streaming into the cabin and it made for some nice photos as we entered Bangkok via the east before turning back out towards the gulf and making for a direct approach from there into Suvarnabhumi airport. However upon a successful landing, we were parked at a remote stand. 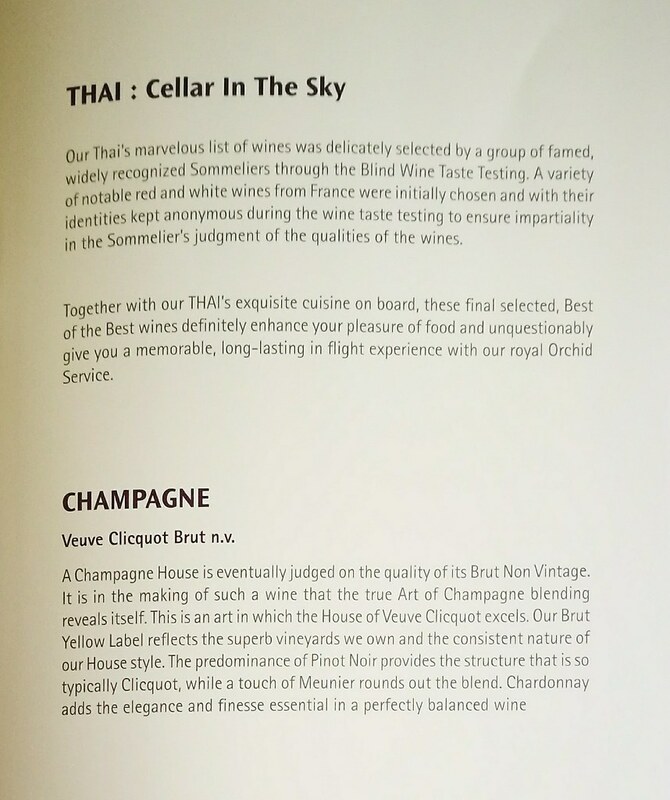 I had expected that being on one of Thai’s newer planes, it would be assigned a jet bridge. Furthermore I had to wait until most of the passengers disembarked before the maintenance crew came to help me retrieve my lens cover. In the end I did manage to get the lens cover back but that meant I was the amongst the last passenger though the bus ride was not full and with a long transit, I had planned to go out into the city. Passengers flying Business and First class on Thai gets to use the fast track immigration counters so that helped to hasten my entry into town as I deposited my hand carry luggage at the airport for a fee and board the train into the city. 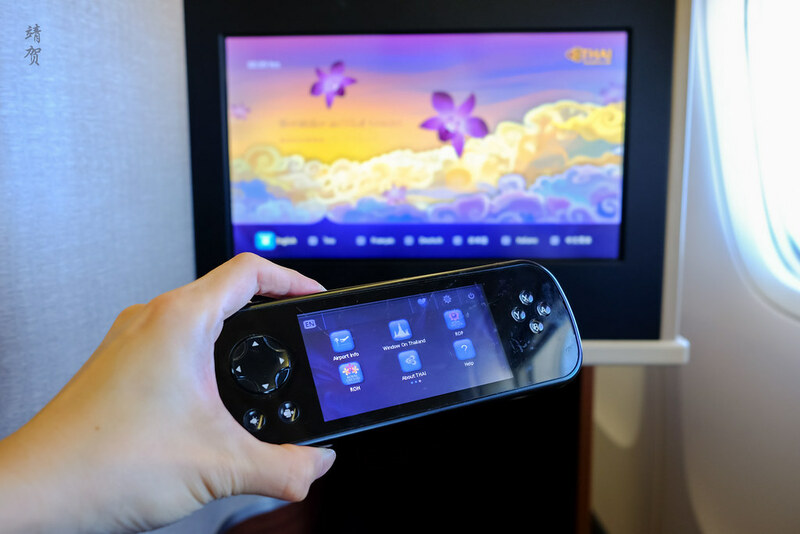 Flying on the new 777-300ERs is certainly nice as the Business class seat is the standard for long haul flights. 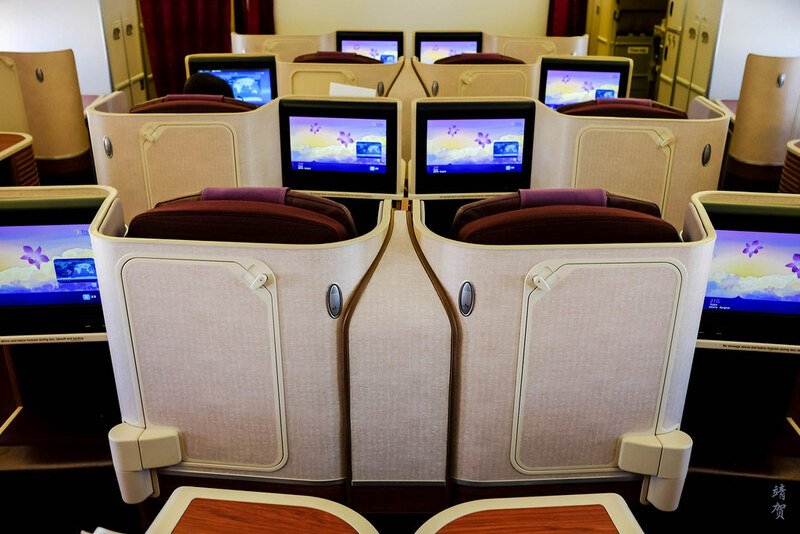 With full lie-flat seats and aisle access for all seats in Business Class, it would add extra comfort and practicality. Service onboard this particular flight was very good with the crew all eager to assist me in getting my lens cover. 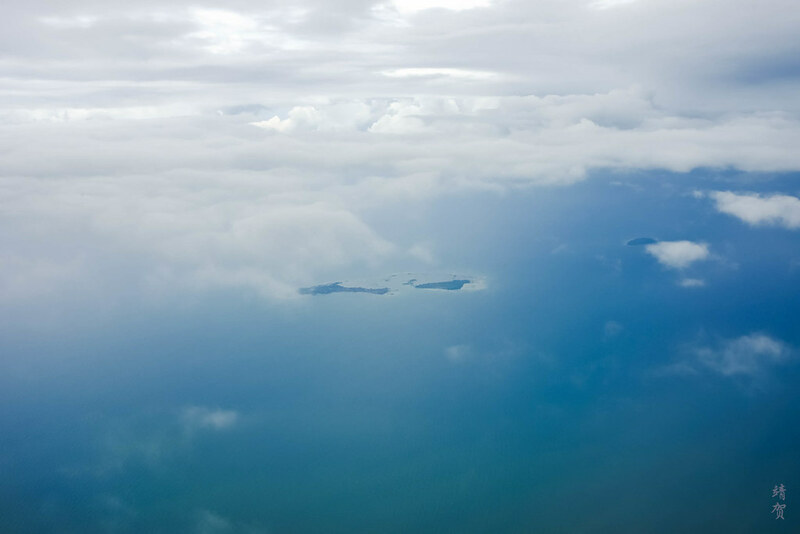 In addition the meal was paced at a suitable speed that was suitable for an afternoon day flight. 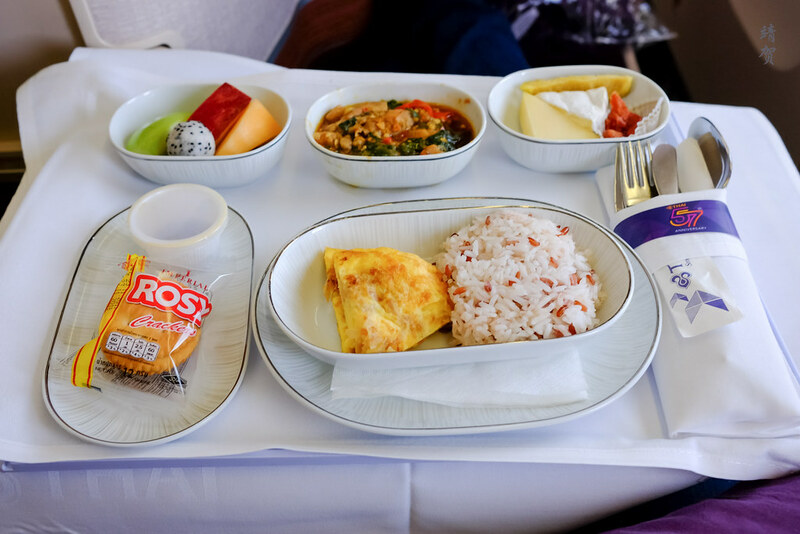 I even enjoyed the Thai cuisine onboard as I liked spicy food so all in all, this was a great flight with Thai Airways and I certainly consider them to be a premium airline and would gladly choose to fly with them again in the future. Thanks a lot for your review! 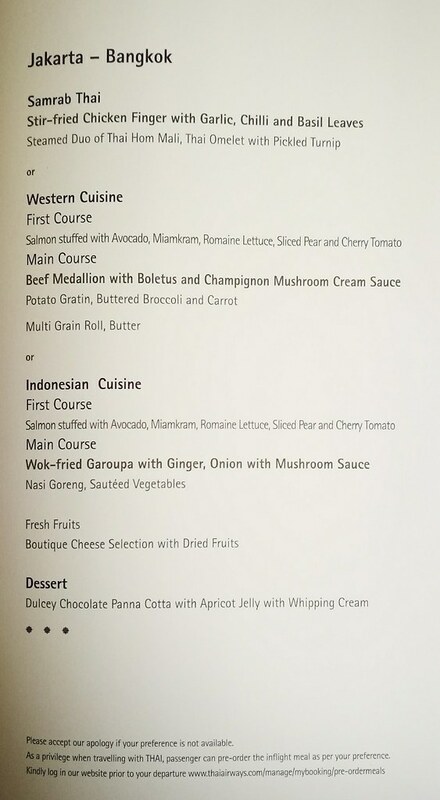 Now I could make final decision to fly Thais instead of Garuda. 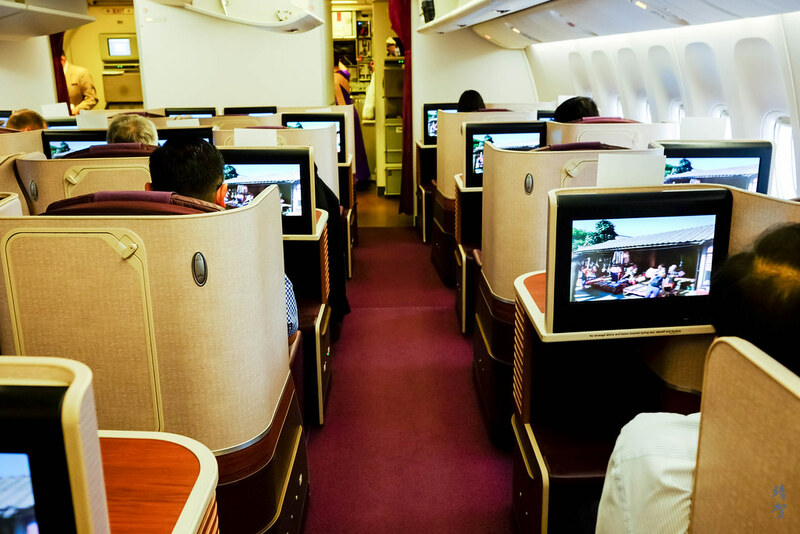 @Pairoj, it also helps that Thai has a much larger worldwide route network compared to Garuda!